If you see a “different” God in the Old Testament, remember this: The first act God took when sin entered the life of Adam and Eve as they felt shame and guilt, was to make a sacrifice to cover their nakendness. Besides being a foretelling of Christ’s death on the cross to cover our sin, it was an act of provision through grace. The rest of the Old Testament consistently tells of example after example of God graciously providing while people who having tasted God’s mercy continually turn away from Him. 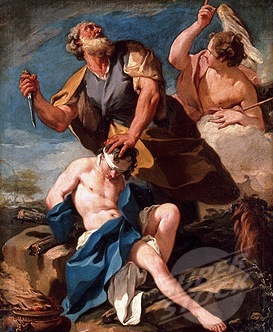 Even Cain was provided for in the wilderness. Both the Old and New Testament tell a complete story of grace and promise of salvation, of unconditional love and mercy unfolding throughout history. One God, administering one program of salvation. When we isolate an act of God without remembering His intiaition of grace and mercy first, we miss everything. Yes, there are consequences for turning away from a perfectly righteous and holy God who rightfuly adminsters eternal justice. But God doesn’t force anyone to spend eternity with Him whose hardened heart doesn’t want to be with Him in this life. The radial acts of love demonstrated by Jesus in the New Testament are equally measured by the radical acts of grace in the Old Testament. Page after page in the Old Testament testifies to this. Equally, the judgement of God over people in the Old Testament is matched by Jesus’ own words; while He spoke much about love and mercy, He spoke more of hell and judgement than anyone else. The Bible never separates God’s grace from judgement. If there were no judgement, there could be no grace. However, we want to separate the two; heaven and hell, judgement and love. For various reasons, we do not want to believe that a loving God would also be a God of judgement because we personally strive to not be judgmental. But some judgement is good and we exercise it daily. For us to have compassion do we not have to judge? Compassion begins with identifying an action and declaring that it is wrong (judging the actions taken against the innocent). Do we want a judge presiding over a criminal trial not to be judgmental? Of course not. We desire justice, a universal truth. There is a judgment that is negative; often the type found when we unfairly criticize another. But then there is righteous judgment that comes over the guilty. Let’s not confuse the two. God’s judgement, seen in the whole Bible, is perfectly just over a people that constantly turn from Him in sin. Even though we are born into sin, deserving of nothing from God, He still pursues us, suffered with us, and grants salvation through grace alone.